Before you install, it will be a good idea to check the available versions of RabbitMQ server by running ‘port search’. All good so far, right. The error is caused because Erlang cannot find the rabbitmq libraries. The libraries should be installed into the same directory as the Erlang/OTP’s core libraries. 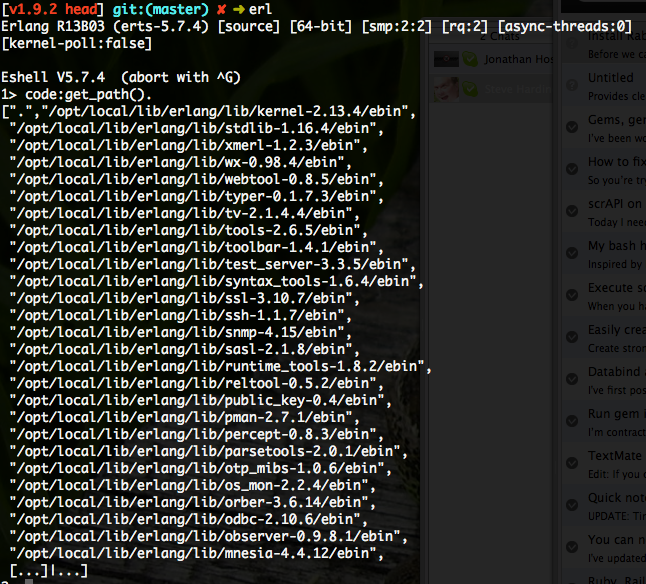 The directory usually is ‘/opt/local/lib/rabbitmq/lib’ when you used MacPorts to install Erlang. Next we need to find out where the RabbitMQ libraries are installed. Normally, with MacPorts install it should be ‘/opt/local/lib/rabbitmq/lib/rabbitmq_server-1.7.2’ (can be another version as well). But, if you used another install method, then you can just search the filesystem for ‘rabbit.beam’ to find the location. 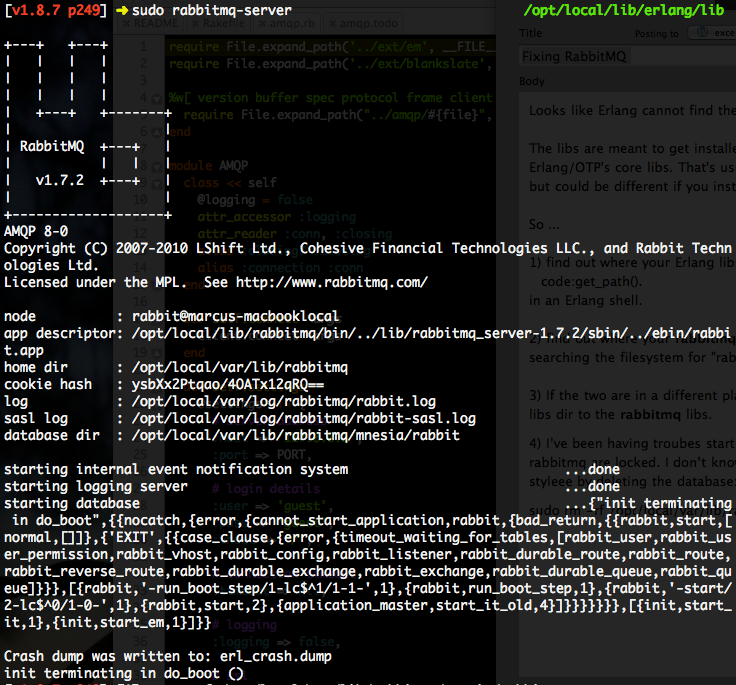 Now, we need to symlink the rabbitmq_server library directory to the Erlang library directory. 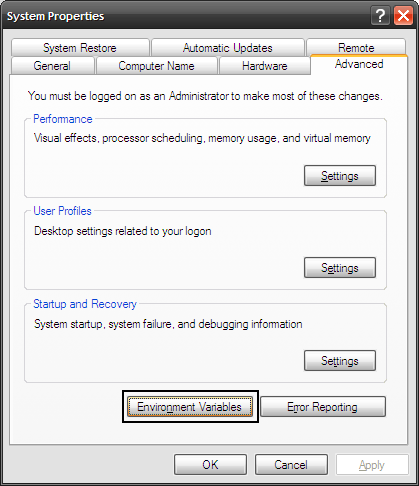 You shouldn’t see any error output for the status call. Make sure your ‘/etc/hosts’ file has an entry to ‘127.0.0.1’ pointing to your computer name. To locate your computer name just look in System Settings > Sharing and at the top you’ll see a box containing the computer name. Hopefully, peeps will find some of this helpful. pgexplain – The Rails gem shows the output, in your application logs, of applying “Explain” or “Explain Analyze” to the select queries of your rails application using PostgreSQL. railsonpg – This is timesaver for middle/large Rails application which use PostgreSQL as database. 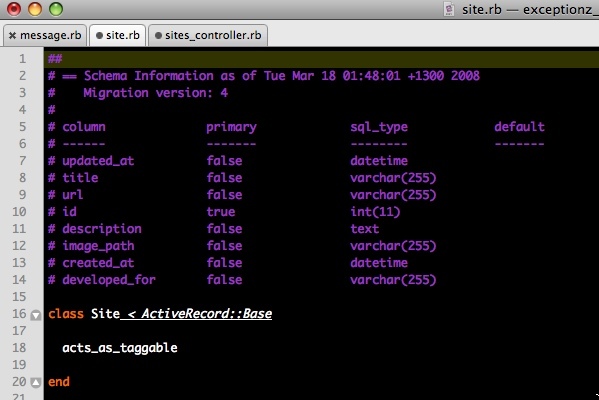 Create/drop Views, Functions, Triggers, Foreign keys in your migrations using ruby syntax. So enjoy these new gems! I grabbed the assaf’s github repository. Nope errors all over the show… Looking at the original exception message, I checked if the libtidy.dylib exist on the lib/tidy directory. Nope, not there…. So where do I get this library file…. Make sure you get a ‘Successfully built RubyGem’ message. Now we are ready to install the newly build gem and test scrAPI again. And there you go, scrAPI working again. sql = "my complex sql statement"
Cool, now you should be able to create strong passwords quickly. I’ve first posted this tip on the 14 of May 2005 and I still get good traffic to the post. So I decided to update the post and code samples to use Framework 2.0 (I’m still not using 3.5) and improve the code somewhat. How do I databind my combo box to my domain object that has a property of some enum type? Quite simple, firstly we will create an object (EnumComboBoxItem) that would encapsulate and represent each item in the combo list data source. EnumComboBoxItem is a pure fabrication class that has two properties we’ll use when databinding to the combo. We have a Value property which is used by the ValueMember property on the combo box and EscapedValue that is used by the DisplayMember property of the combo box. Note that when we construct a new EnumComboBoxItem instance that we call the AsciiEscape method in the constructor when populating the escapedValue field. 29 /// Initializes a new instance of the class. 43 /// Gets the escaped value. 45 /// The escaped value. 52 /// Gets the value. 65 /// Returns a that represents the current . 68 /// A that represents the current . 80 /// Creates the data source for the enum type. 83 /// When the type passed is not an enum the exception is raised. 85 /// Returns a generic list to be used as the combo datasource. The EnumComboBoxItem.CreateDataSourceFor method creates an List&amp;lt;object&amp;gt; for us to use as a data source for the combo box. 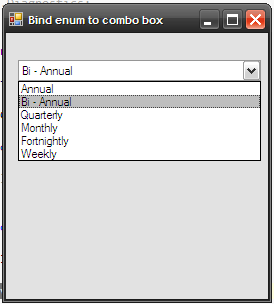 And there you have it, a Combobox bound to an Enum! On the desktop right click the ‘My Computer’ icon and select properties. Now you can either add the HTTP_PROXY variable to the ‘User’ or the ‘System’ variables by clicking the ‘New’ button. You should see similar output as shown above. Now we can work again without any issues when trying to install or update gems. Edit: If you can’t wait until the end, here is the download link. Who hasn’t used the Annotate Models plugin written by Dave Thomas, of Rails Pragmatic Studio fame? If you haven’t don’t fret… The plugin basically adds a comment block to the top of all of your model classes documenting the current database schema for the given model. I like to have the info in my model files to make it a little easier to work with models. The rails bundle within TextMate gives you a ‘Show DB Schema for current class’ command you can press to show a tool tip with the database schema (Control + Shift + Command + S). This works great, but I find the command sequence to long and the slight wait to see the schema info breaks my rhythm. To solve the problem I made a copy of the source files used by the command and modified it slightly to output the info as comments at the top of the file. Now I have nicely annotated model files. This is a real time saver.